Change up the vegetables and fresh herbs in this salad to what you have on hand. Cook orzo according to package directions. Place vegetables in a large bowl. In a small bowl, whisk dressing ingredients. Add to vegetables and toss to coat. Remove vegetables, reserving dressing. Grill mushroom, pepper and onion, covered, over medium heat 5-10 minutes or until tender, turning occasionally. Grill green beans and zucchini, covered, 3-4 minutes or until desired doneness, turning occasionally. When cool enough to handle, cut vegetables into bite-size pieces. 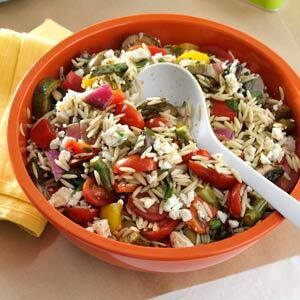 In a large bowl, combine cooked orzo, grilled vegetables, tomatoes, parsley, basil, salt, pepper and reserved dressing; toss to combine. Serve at room temperature or refrigerate until cold. Just before serving, stir in cheese. Yield: 8 servings.